What an odd schedule around the NFL in Week 9. Frankly, most of the matchups are pretty boring. But then we were gifted the Rams-Saints showdown in the late Sunday afternoon window - which I previewed here at Doc's and recommended Saints and under that massive total - and then the Packers-Patriots/Rodgers-Brady epic on Sunday night. If you are looking for interesting quarterback play or high-flying offenses like in those two games on Monday night when Tennessee visits Dallas, well, you are out of luck. This is going to be like football in the 1990s: Run, run, short pass & punt. Field position and defense. Or it will end up 44-42 and both Marcus Mariota and Dak Prescott throw five TDs each. What do I know? (Pretty sure the latter won't happen). Other than both these teams being similar offensively (i.e. boring) and defensively (pretty good), not much of a common link here other than the Titans used to be the Houston Oilers and Oilers-Cowboys was always a big deal because all football in Texas is a big deal. Well, three other things in common: Both come off a bye week (don't see that too often), both are 3-4 and both are likely to miss the playoffs. First-year Titans coach Mike Vrabel is completely safe, but Cowboys coach Jason Garrett absolutely isn't if that's the case. Tennessee is +450 at Bovada to win the AFC South (I'm assuming Houston will), and Dallas is +350 to take the NFC East (torn between Washington and Philly there after both got better in trades Tuesday). To make the playoffs, the Titans are +220 (no -340) and Cowboys +300 (no -500). Most of the time when Bovada posts a special weekly prop, I know why. However, when researching this article I saw one on whether the Titans are successful on a 2-point try all season. "Yes" is -200 and "no" +150. OK, I knew that Vrabel went for 2 in Week 7 in London after the Titans had rallied vs. the Chargers to pull within 20-19 in the final minute. There are aggressive coaches and aggressively stupid coaches. What Colts coach Frank Reich did in overtime in Houston earlier this year was the latter. Who can fault Vrabel for believing in his team to get 2 yards for a victory? His "gut" already had won an OT game vs. the Eagles. Alas, Mariota's 2-point pass try vs. the Bolts was incomplete. Tennessee has now failed on seven straight 2-point tries dating to the 2015 season and passed on all seven. That, I didn't know. Their last successful try was Week 14 of 2015, a blowout loss to the Jets. Why wouldn't Vrabel use Mariota, his mobile QB, or his bulldozer running back Derrick Henry vs. the Chargers? Mariota has really regressed this year (just like draftmate Jameis Winston), and Henry has been a huge bust. 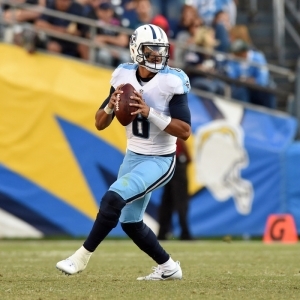 The Titans are 30th in yards per game, 30th in points (15.1), 30 th in passing (173.0) and 19th in rushing (107.9). This team is lucky to be 3-4 as it could easily be 0-7. Then again, it could be 5-2. Only two losses weren't at the wire. The defense ranks third (18.1 ppg). The Cowboys are similarly bad passing the ball (29th at 183.1 ypg) and not much better in scoring (20.0 ppg), but they are one of the best rushing offenses (136.9 ypg) with Ezekiel Elliott and a still good-but-not-stellar offensive line. Dallas made two interesting moves during its time off. The big one was trading for Raiders receiver Amari Cooper. The former Alabama star looked like the next Julio Jones his first two seasons but more like Julio Iglesias last year and this one in terms of drops, etc. It cost Jerry Jones a 2019 first-round pick. That could easily be in the Top 10 and the best move Jon Gruden has made, but Jones had to do something as his receivers were the NFL's worst. His fault for chasing away Dez Bryant and not replacing Bryant or Jason Witten. In a surprise earlier this week, the Cowboys fired offensive line coach Paul Alexander. He was only named to the role this offseason, coming from Cincinnati. It is the first in-season move Jason Garrett has made on his coaching staff since taking over full time in 2011. Alexander was replaced by former NFL offensive lineman Marc Colombo, who has been the assistant offensive line coach since 2016. But the real new boss likely will be Hudson Houck, hired as a senior assistant. He had two stints as the Cowboys' offensive line coach from 1993 to 2001 and from 2008 to 2011. Not sure why Alexander was the fall guy considering that entering Week 8, Elliott had the most yards rushing before contact (393) in the league, which is a sign of positive blocking. At 5Dimes , Dallas is a 7-point favorite (+110) with a total of 41. On the moneyline, the Cowboys are -275 and Titans +235. On the alternate lines, Dallas is -6.5 (-110) and -6 (-118). Tennessee is 4-3 against the spread (2-2 on road) and 2-5 "over/under" (1-3 on road). Dallas is 3-4 ATS (2-1 at home) and 2-5 O/U (2-1 at home). The Titans have covered six straight Monday games. They are 2-5-1 ATS in their past eight after a bye and 2-8-1 ATS in previous 10 in November. The Cowboys are 9-4-1 ATS in their past 14 vs. teams with a losing record and 13-9 ATS in their past 19 out of a bye. The under is 5-1 in Tennessee's past six. It's 13-3 in the Cowboys' past 16. Really not going to overthink this. The Cowboys are unbeaten at home and trashed Jacksonville in their last game at JerryWorld. The Titans are on a three-game losing streak and have yet to top 20 points in regulation this year. I really like Dallas at -6.5 and love the under even at a low number of 41.